In our first blog post, we described the fantastic signal quality of the Open Ephys acquisition system. 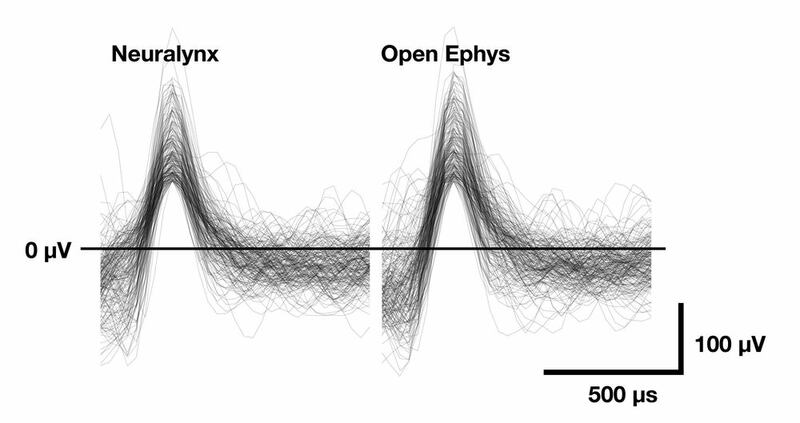 Today, we made our first direct comparison between signals recorded with Open Ephys and those recorded with a Neuralynx Digital Lynx system. The conclusion? The recordings are virtually indistinguishable. There's still more rigorous testing to be done, but to the trained eye of a seasoned electrophysiologist, the signal quality of the two systems is qualitatively identical. Read on to see for yourself. We performed the test by recording from a mouse implanted with an eight tetrode flexDrive. The Omnetics connector on the electrode interface board was compatible with both the Open Ephys headstage and a special-ordered Neuralynx HS-36. Open Ephys headstage (left) and Neuralynx headstage (right) used for the test. The Open Ephys headstage is based on the Intan RHD2132 amplifier chip. It measures 25 x 13.5 mm and weighs 1.0 g. The Neuralynx headstage is based on the Analog Devices AD8643 chips (we think). It measures 27 x 21 mm and weighs 2.3 g.
The mouse was placed in a 1' x 1' arena, and attached to either recording system via a tether that was counter-balanced via a system of pulleys. The tether used by the Open Ephys system (available for purchase from Intan Technologies) weighs 8.2 g/m, contains 12 conductors, and is 2.9 mm in diameter. The tether used by Neuralynx weighs 10.1 g/m, has 44 conductors, and is approximately 3 mm in diameter. The Open Ephys acquisition board (shown here in a special-edition yellow case) measures 16 x 16 x 4 cm, weighs 0.3 kg, and costs approximately $30 per channel. The Neuralynx Digital Lynx SX system measures 45 x 27 x 30 cm, weighs quite a bit more than 0.3 kg, and costs approximately $1000 per channel. The examples below all come from a single electrode, but the signals across all 32 channels are identical between the two systems, as far as we can tell. We hope to carry out a more detailed comparison in the near future, but we couldn't be happier with the initial results! Several seconds of raw data from each system. If we can spot any difference, it's that the Neuralynx recording has slightly more high-frequency noise (but we haven't quantified this yet). Zooming in, it's clear that the signal quality is basically identical. Spikes extracted from the continuous signals also look the same. Since this was a hippocampal electrode, we could directly compare ripple oscillations recorded by the two systems. Again, we can't see any difference.